the juxtaposition of meanings - of time and space - in this photograph is quite interesting. there's the young couple facing the sea, in a world of their own, dwelling in love. and then there's the widowed-lady, perhaps yearning for a love gone by. alone, she sits facing the city and watches the passer-bys. 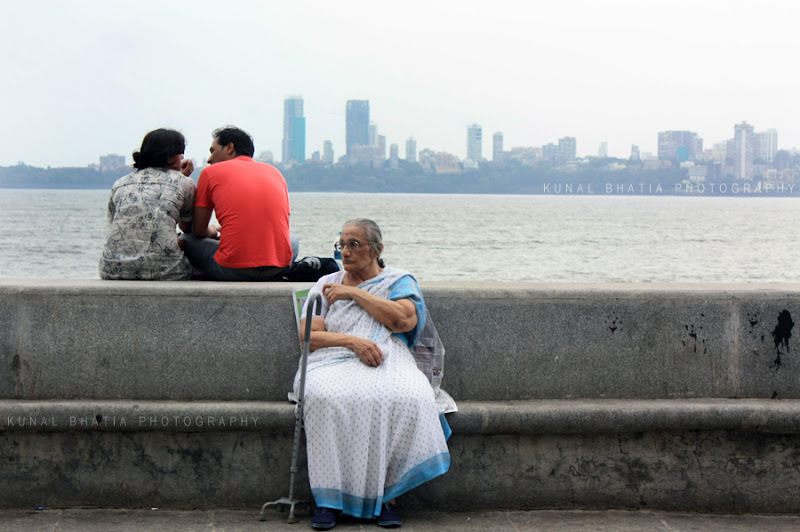 shot at marine drive. another photo from the same evening here: love and the city. Lovely theme. Some really unique themes in your blog ! This is wonderful and sad. Wonderful capture. Great picture, so are the others on your blog. Thanks for leaving a comment on my blog a while ago. I just hope she's not their chaperone! Oh my, what a great capture! I love it! and also a beautiful skyline. cheers! Great picture...aptly captures the mood. I love your insightful thinking. I am more in love with the way you perceive things than just the pictures. this is definitely one of the best from marine drive i have seen.